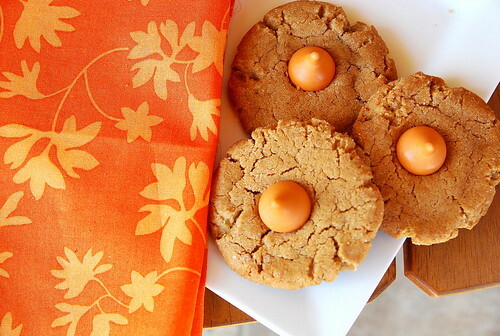 You know those famous cookies called Peanut Butter Blossoms? The ones you’re guaranteed to find at every holiday cookie exchange — peanut butter cookies with a Hershey’s kiss inside? These are a nice riff on those, but even more delicious. Instead of peanut butter I used “cookie butter” and instead of the standard Hershey’s kiss I used their seasonal Pumpkin Spice kiss. Then I coated them in cinnamon sugar for an extra hit of flavor. I think these are yummier than the original peanut butter version. I may have inhaled them for breakfast. You can buy Cookie Butter at Trader Joe’s. The brand name for it in other stores is Biscoff spread, and it’s a spiced cookie spread that’s usually found near the peanut butter in your grocery store. It is so darn good I dare you to not spoon it right out of the jar. I found the Pumpkin Spice kisses at Target and Walmart. Bake until cookies are beginning to crack on the surface and the bottoms just begin to brown, about 10 minutes. 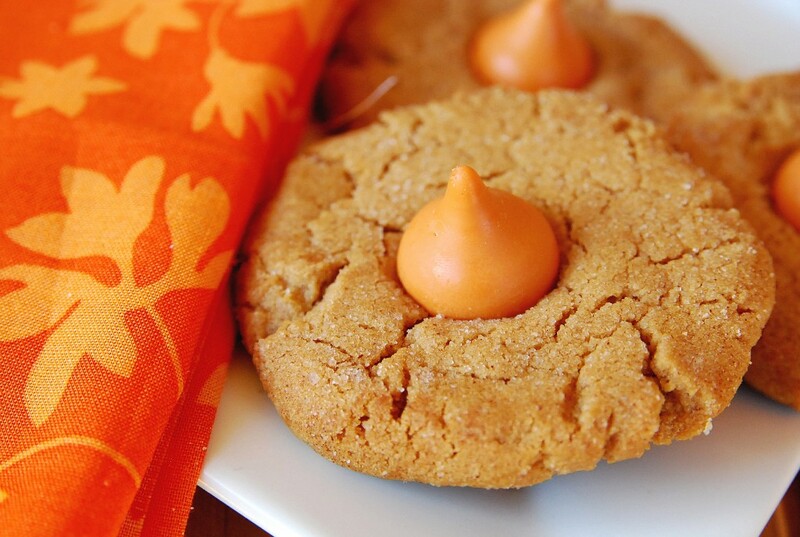 Immediately after removing cookies from the oven, place a pumpkin kiss in the center of each cookie, pressing it down gently. After a few minutes, transfer cookies to a wire rack to cool.